A fun, friendly, convenient way to know about sales, specials and deals. Relevant real-time information is always with you and doesn’t require any clipping or printing. Best of all there is no monthly service fee or per message costs to you. 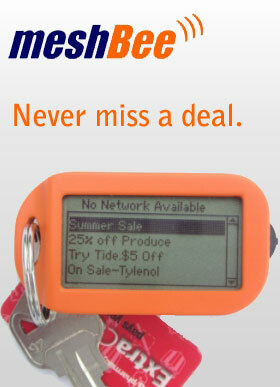 Use your cell phone for talking and texting, use meshBee to stay in the know and on the move while shopping. Walk near a participating retailer, mall, restaurant or property owner and we'll tell you what deals are going on near you. Then we'll make it easy for you to redeem those deals when you check out. No monthly service fees. No per message costs. No wireless data plans. The meshBee service is free to shoppers.